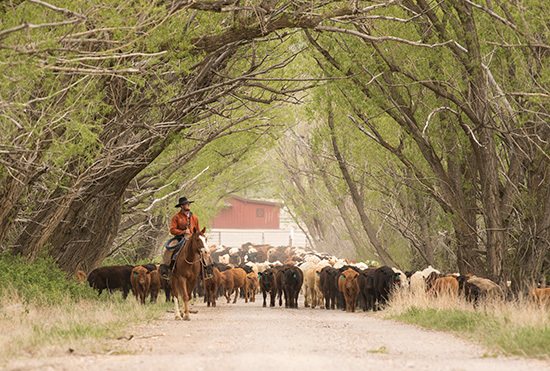 Our cattle enterprise serves as the ranch’s primary source of income. For this reason, our ultimate goal is to produce the highest quality, most environmentally-adapted cattle possible while using the least inputs necessary to provide a sustainable, healthy, and nutritious beef product all the way from our vast landscape to the consumer. Our management philosophy for our cowherd involves working with nature, not against. We time our calving season to coincide with the forage production cycle of our range grasses and manage grazing patterns to mimic those similar to wildlife migrations. Calving season for our ranch begins around mid-April each year with the last calves being born by the first week of June. This ensures calves are vigorous and healthy, production costs stay low, and allows for our crew to easily hold brandings during transitions from one pasture to the next. During the fall and early winter, our calves are weaned and moved to irrigated pastures. Generally, at this time steers are sold, while heifers are retained throughout the winter later joining either our replacement herd or entering our grassfed beef program the following spring. We winter most of our cowherd out on the range with the exception of some older cows or younger first-calf heifers. During this time, cattle have access to quality protein and vitamin-mineral supplements to assist with their nutritional needs. When conditions merit it, such as during severe weather, we also feed hay, however this is done only on rare occasion. 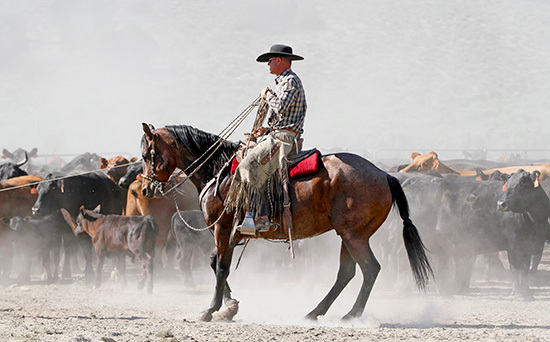 We manage our cattle for optimum, rather than maximum, production and focus on producing adapted, high quality cattle which flourish in the challenging, and sometimes harsh, environment of northeast Nevada. To this effect, we have selected only the best of our older cows which have survived in our environment for 10 years or more while successfully weaning a calf annually to carry our genetic base forward. These genetics combined with those of hand-selected bulls are the future genetic base for our breeding bulls. We feel this strategy ensures our vision for cattle which are economically relevant to our environment will continue to be carried forward.